trimmed down to a form that would move him up from 9th to 7th by the finish. 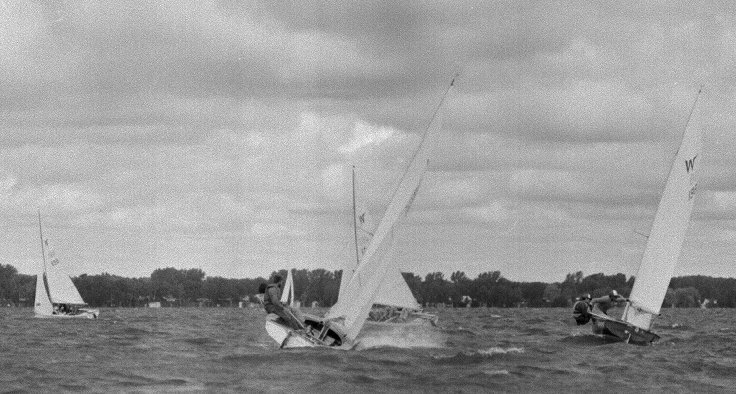 After a brief moment of excess heel, Richard and Sharon Stone (4960) ease the boom to the corner of the transom to get 4960 back onto her feet. It looks also as though they may lift out over Geoff Hodshon but how can you beat a crew that gives you hiking like that!!? Nick White (r) who rounded 8th meanwhile seems not to be getting the favourable slant being given the Stones. 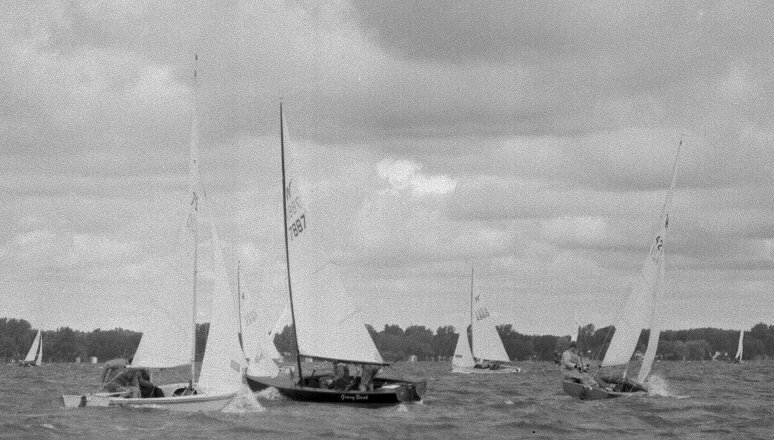 These boats separated a bit by the finish where it was Geoff 7th, Nick 9th and Richard 12th. Joe and Janis Schnur (2957) round on their way to 13th place - their best finish of the series. Their main though, looks to have the draft well aft and could maybe benefit from some cunningham soon. to help him bear away for the starboard boat: main out and boat flat! Two of the series leaders must have picked some shifts wrong in this one as both Tony Perkins (7043) and Trevor Rose (955) are well out of the top ten at this point. Trevor and Tony would both pass John hammond (7887) and end 14 - 15 ahead of John while Martin Collen (88) would end 17th. 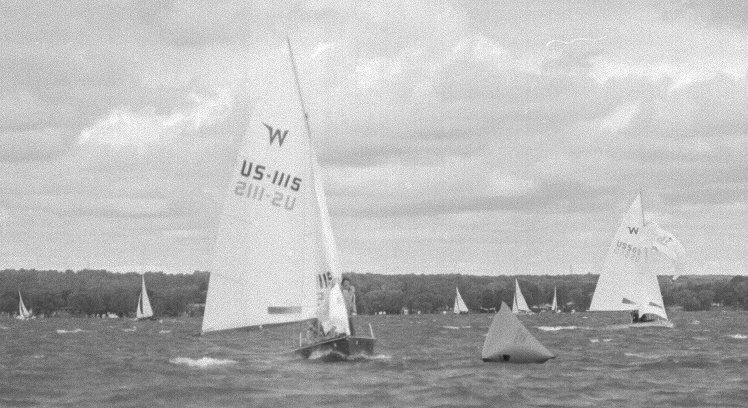 Also approaching the leeward mark are Bill Fyfe (6739) and Earl Schnur (dark hull) who would end up placing 23rd and 21st respectively. 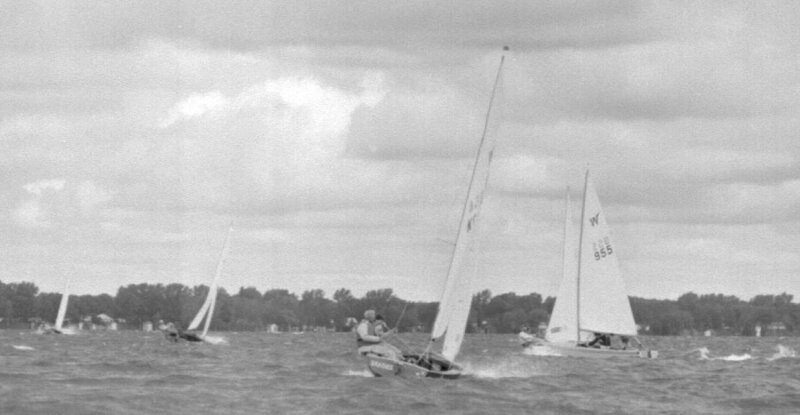 Colin Wilson (1) sets off in pursuit of Geoff Hodshon (198, left), a move that would pay off in a 10th-place finish. As Trevor Rose (955) tacks to get away from Tony Perkins, Uncle Al (SHADES) finally makes his appearance. 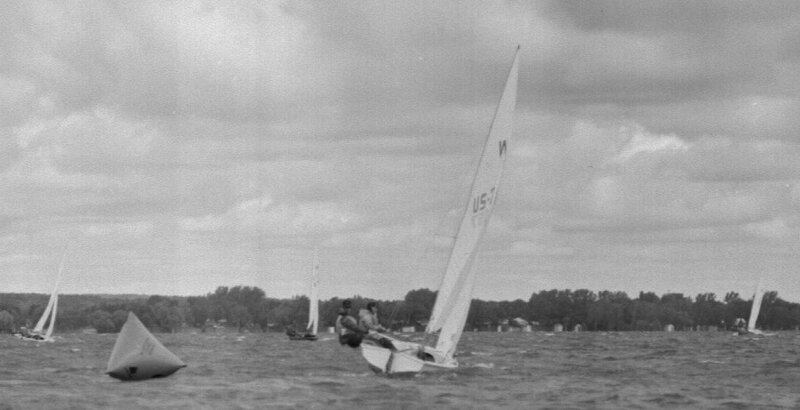 Note the very flat mainsail which might have helped had Al not screwed up so many other things. for the puff which he doubtless should not fight so much with his rudder. Still, Earl ended up beating Bill! 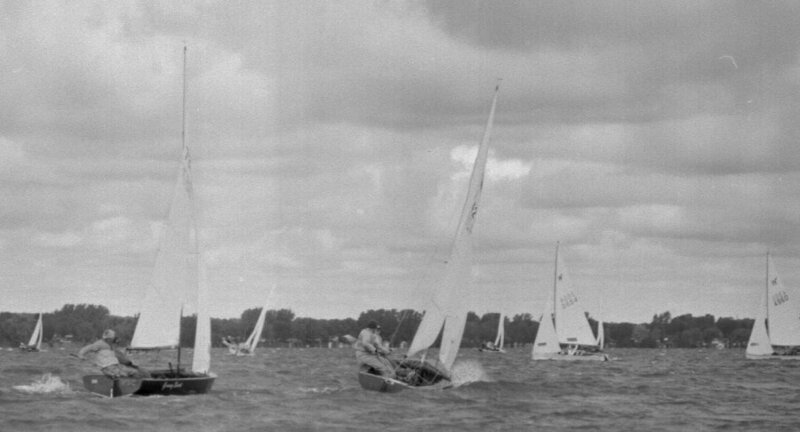 John deBoer (6090), Don gallagher (4406), Hubert dauch (1191), Graham Dodd (3651).